Canadians are More Likely to Support Northern Gateway Pipeline than Oppose It. 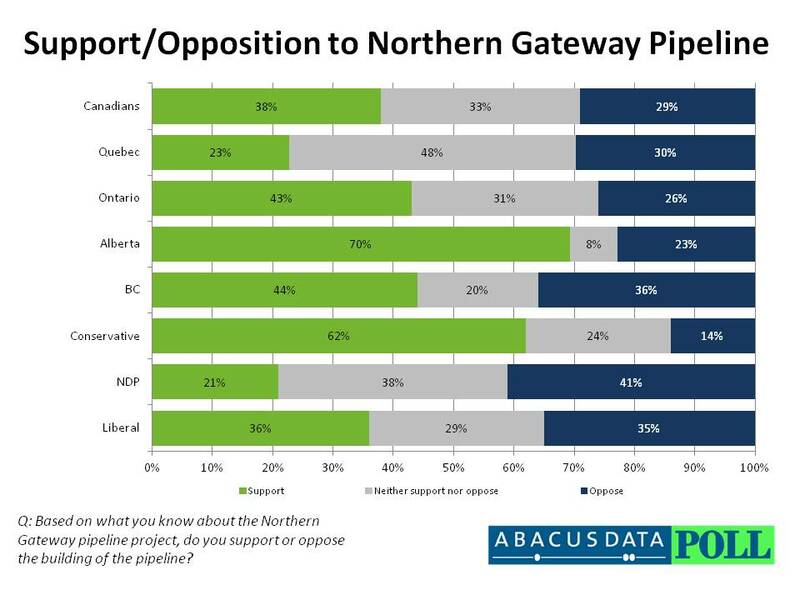 According to a new national survey from Ottawa-based Abacus Data, almost four in ten Canadians surveyed support the Northern Gateway pipeline, a pipeline project proposed to run from northern Alberta to the coastal community of Kitimat, B.C. Nationally, while awareness of the project was relatively high at 65%, a plurality of Canadians surveyed (38%) said they either strongly (15%) or somewhat (23%) supported building the pipeline. In contrast, 29% either strongly (13%) or somewhat (16%) opposed the project. The remaining 33% of survey respondents said they neither supported nor opposed the project. Regionally, the pipeline was most likely to be supported in Alberta where 70% of respondents indicated they either strongly or somewhat supported the project. While in Quebec, respondents there were the least supportive with less than one in four saying they supported the new pipeline that would transport bitumen from the oil sands in northern Alberta to tankers at the deep water port in northern British Columbia. In British Columbia, where hearings by the National Energy Board began last week, support was more polarized with 44% of B.C. respondents supporting the pipeline and 36% saying they opposed it. Outside of Alberta and B.C., the high number of Canadians who said they neither supported nor opposed the pipeline indicates that a lot of Canadians have not yet made up their mind about the project or many are simply indifferent. In fact, when we take a close look at the numbers, opposition to the pipeline does not rise above the 36% opposition registered in B.C.. This indicates an opportunity exists outside of BC and Alberta to convince Canadians of the merit to the proposal and the potential impacts, both positive and negative, that it could have on the economy and the environment. Politically, the pipeline is far more polarizing. Supporters of the federal Conservative Party are the most supportive (62% support/14% oppose) while opposition is highest among NDP supporters (21% support/41% oppose). Liberal Party supporters are more divided with 36% supporting the pipeline and 35% opposing it. The survey also asked respondents to rank five factors that the federal government should consider when deciding to proceed with the project from most important to least important. Overall, respondents were more likely to rank environmental considerations as important ahead of the economic benefits derived from the project. Interestingly, Conservative Party supporters were more likely to rank national economic benefits as the most important while NDP and Liberal Party supporters ranked environmental impacts as their most important consideration. As this issue continues to be debated, public opinion data suggests that the pipeline has the potential to polarize the country, like other issues pursued by the Federal Government, with Conservative Party supporters on one side and opposition party supporters on the other. The survey data also indicated that impressions of the Alberta oil sands overall was a key predictor of the pipeline. It is clear, and not surprising, that the debate over the future of the oil sands cannot is not independent from the debate over the pipeline. In light of the Obama Administration’s rejection of application to build the Keystone XL pipeline, the survey found that opinion about the Keystone XL pipeline divide in similar ways to the Northern Gateway pipeline. Over three in ten Canadians surveyed (35%) said they supported the Keystone XL pipeline while 28% said they opposed it. A larger group of respondents (36%) neither supported nor opposed it. Again, support for the Keystone XL pipeline was highest in Alberta (68% support/24% oppose) and lowest in Quebec (18% support/26% oppose) and opinion was correlated to federal party support (CPC voters 57% support/13% oppose, NDP voters 19% support/40% oppose, Liberal voters 35% support/33% oppose). These numbers suggest that on both the Northern Gateway and Keystone XL pipelines, the Liberal Party faces the more difficult task in finding a nuanced position on the projects that satisfy a rather polarized base of support. From January 16 to 29, 2012, Abacus Data Inc. conducted an online survey among 1,000 randomly selected Canadian adults from an online panel of over 150,000 Canadians.